The 100 lb. 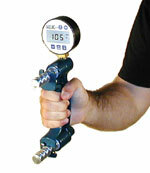 (45 kg) digital pinch gauge uses the same hydraulic system but has the added advantage of an easy-to-read LCD display. 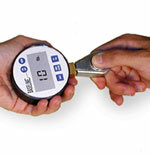 Features an electric zero calibration system and 2 “AAA” batteries. Push button console includes a button to zero the last maximum reading stored in memory, a maximum button to display the highest reading since the last press of the maximum clear button, and a lb./kg. toggle button to change the measurement reading.